The Western Australia Government is well on its way towards becoming a force of digital transformation. With the appointment of Giles Nunis to the post of Government Chief Information Officer for the whole of Western Australia, the state is witnessing an overhaul of its digital services and technologies. On 15th March, 2016, over 100 representatives from the Western Australian Government public sector were brought together to initiate a conversation about how they can help the state emerge as a leader in innovation and technology integration. Mr. Mohit Sagar, Managing Director, OpenGov Asia, opened the forum by discussing how technology will continue to disrupt our daily lives and how public sector can avoid becoming irrelevant or out of date. He asked that the delegates take advantage of their time at the forum to come together and share their experiences. They will then give each other advice on how to navigate through the sea of digital transformation. Before the forum, Mr. Nunis told us that he was looking forward to hearing from the international speakers as they shared their ICT plans and strategies. “The reason I was attracted to this particular forum was because of the international speakers. If we wanted to run a government, we must involve people from Singapore, Malaysia, and New Zealand. They introduce a different way of thinking and I think it should be a key focus of ours in carrying out our plans,” stated Mr. Nunis. Quicker communications, better decision-making, and more predictive modeling, are just some of the incentives of digital transformation. From this, it is evident that the Western Australia Government has realised how important it is to capitalise on new technologies in order to benefit society as a whole. Mr. Zaqy Mohamad, Chairman, Government Parliamentary Committee for Communications and Information, Singapore, was the international keynote for the forum and he shared how the government is implementing Singapore’s Smart Nation vision. “In making a Smart Nation work, we must build on our strengths, focus on areas we want to develop and drive visible outcomes, but at the same time build the manpower to support these technologies,” Mr. Mohamad said. Mr. Mohamad serves on the Committee on the Future Economy, a group formed by private and public sector aiming to address the oncoming economy shift as technology begins to play a larger part in Singaporeans’ daily lives. Mr. Mohamad emphasised that Singapore’s Smart Nation plan is a long time coming, although the programme was just announced in the end of 2014. With the growing demand for IT initiatives, the Singapore Government has successfully driven the population to embrace the future of technology as it will work to help improve our daily lives. “We are fortunate to have an IT savvy population, with Singapore having an 80 percent rate of mobile penetration,” stated Mr. Mohamad. One of the greatest takeaways from Mr. Mohamad’s keynote touched on Singapore’s drive to transform transportation throughout the island using frontier technology. “We cannot keep building roads so we must look for breakthroughs in transport and technology, so that we can improve the commuting system… and looking to put up more real-time transport data through mobile applications,” he stated. Following Mr. Mohamad’s remarks, the forum delegates were prompted to start their open dialogue table discussions where they would share their experiences with their counterparts from other public sector agencies. The topics covered were: Big Data Analytics for safer streets; Enabling Rapid Innovation in a Connected Government; Public Sector Efficiency Enhancement – Sharing of Best Practice; Open Government needs Open Platforms; The Cloud: A Channel for Government Service Delivery? ; Delivering the best Citizen Experience through Digital Transformation; and other such laptops. Western Australia’s Government will be undergoing a huge technology overhaul, with the Office of the Government CIO leading the way for other agencies and organisations. When the audience was asked about the strength of their IT capacity, 40 percent of the delegates told us that their IT permanent staff head count is from 1-10. Over 47 percent of the delegates reported having 1-10 contractors on top of permanent staff. Over half of the delegates (52.3 percent) relayed that they are working on their IT strategy at the moment and have not yet carried it out. The IT budget ranges from 3 percent to 6 percent for 29.7 percent of the attendees’ respective organisations. From this, it can be concluded that agencies are fairly invested in the future of digital transformation. This is why the Government Chief Information Officer has made it his mission to streamline government ICT innovation. Giles Nunis, Government Chief Information Officer, Western Australia Government, took to the stage to introduce his plans to introduce the Innovation, Collaboration and Transformation (ICT) Approach by WA Government, creating a roadmap towards change which will drive towards digital government that streamlines citizen’s services. This repeats what Hon Bill Marmion had stated to the forum in his address and it is important that this message is resonating throughout the top of government so that solutions may be carried out more efficiently. “Our vision is to achieve a truly agile and responsive public service that delivers high-quality services. To realise this, the Government is focusing on technological innovation, both within the public sector and as a source of wider economic growth for the State,” Hon Bill Marmion emphasised. Outside perspectives and input are important as Western Australia will be embarking on a new chapter of digital transformation. With this, it is still important to keep in mind that there is no cookie cutter solution to driving new ICT strategies in Government. “It does not mean that we must use a particular technology or service, but we are saying that if we are driving down a particular path, we must not deviate from each other,” said Mr. Nunis. With this, the Office of the Government CIO for Western Australia is executing ambitious programmes which are aimed at delivering a more unified approach to digital transformation. “We are looking at consolidating our technological platforms and enabling better communication across all of government,” Mr. Nunis told the audience. At the forum, we were shown the many ways that government is beginning to see the benefits of embracing data and how they will be looking to further integrate solutions. Based on our polling, we learned that big data and analytics will be a key focus area for 26 percent of the delegates. In executing a data analytics strategy, 50 percent of the delegates already have a data analytics plan in execution. Over 36.6 percent of the delegates felt that the value of data analytics is understood by their organisation, while another 35.2 percent believe that their organisations do not understand. This tells us that only some organisations are acting on the rise of data analytics and perceive it to be valuable to them. When it comes to learning data analytic skills, 70 percent of the delegates said their organisations develop these skills in house, rather than out of house. Many Governments are beginning to push open data initiatives, in order to garner data sets and derive unique insights that will allow for better decision making. Mr. Zaqy Mohamad spoke about why it is important for Singapore to encourage data sharing and collaboration with the data.gov.sg. “It is all about building a safe and trusted data marketplace,” Mr. Mohamad emphasised during his keynote speech. At one of the open dialogue tables, delegates discussed asking the bigger questions about data analytics in government. As we are all participating in the collection of big data, it is only appropriate that the public sector make an effort to understand this in more depth in order to deliver more responsible services. Dr. Leong Mun Kew, Deputy Director, Institute of Systems Science, National University of Singapore, led the discussion and asked what the delegates’ biggest questions about big data were. Dr. Leong emphasised that there was a difference between smart data and dumb data, depending on how clean the data sets were and if they demonstrated value to the organisation. In response to Dr. Leong, the delegates expressed their desires to learn more about big data and how they can use it in their organisations. While listening into the conversation, we learned that some organisations are concerned about getting real-time data in order to make better decisions on the spot. Other concerns which were raised included how organisations can ensure that their data is protected while using some of these new solutions. A big debate throughout the duration of the forum was whether Western Australia Government organisations are ready to move to the cloud or not. Forty-four percent of the attendees thought that building skills to move to the cloud was a high priority. More than 40 percent of the audience is executing a cloud computing solution, while 26 percent of the audience will be looking to execute cloud computing in the next 12 months. 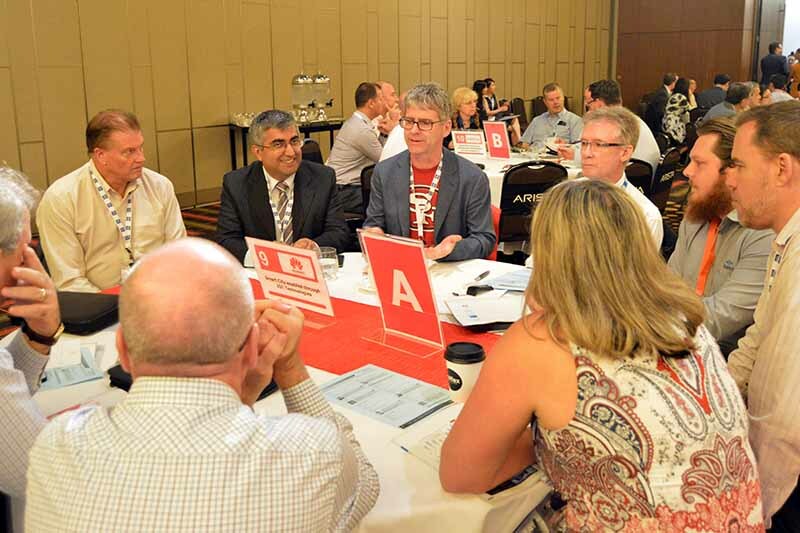 Jack Hondros, Chief Information Officer, Department of Planning, Western Australia, hosted a dialogue table where he shared on his experience on moving to the cloud with his fellow delegates. From what we learned today, Western Australia will be looking to embrace more cloud computing solutions in the near future – if they have not already executed solutions. They are becoming less hesitant to move into the cloud as they see more benefits than risks.